Thermopylae, in ancient times a narrow pass between mountain and sea along the east coast of Greece, is celebrated in history and literature as the site of a heroic battle in the face of overwhelming odds. There, in 480 B.C., 300 Spartans led by King Leonidas took their stand against an immense Persian invasion at the pass of Thermopylae, gateway to central Greece, temporarily halting the invasion of Greece by Xerxes and his army. Although the Persians overwhelmingly outnumbered the Greeks, Leonidas resisted the advance of the Persian army for two days. On the third day, when the Persians approached from the rear and no reinforcements were in sight, Leonidas dismissed most of his troops. 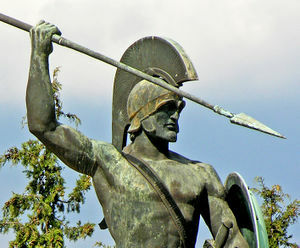 Assisted by the remaining Greek allies, Leonidas and his 300-member Spartan royal guard fought to the last man, while the Persians lost 20,000 men, according to Greek historians. Although Leonidas fell in the battle, he protected the Greek fleet from being outflanked by the Persians. The Greeks were not victorious at Thermopylae, but they soon turned the tide of the war by defeating the Persian fleet at Salamis—where but a few Greeks were lost—thus forcing Xerxes and his army to retreat to Asia. As a result of this stand at Thermopylae, Greece lived to enter a brief but brilliant golden age. Golden ages come because peoples and societies are self-sustained by their inner sense of wholeness. And by their wholeness they are willing to stand against all odds for the principles of absolute Freedom, Peace, Truth and Universal Enlightenment. Leonidas was an embodiment of Serapis Bey. Pearls of Wisdom, vol. 38, no. 8, February 19, 1995. Pearls of Wisdom, vol. 32, no. 7, July 2, 1989. This page was last modified on 22 June 2016, at 17:38.